Forget Tommi’s Burger Join, forget Juicy Burger, and you can even ignore Haché. I’ve never heard so many people talk about their new favorite burger as I have with Gasoline Grill. It’s almost annoying not to have tried it before the hype considering I’ve had it on my to-do-list ever since it opened in April last year. Now, that it’s been highlighted among the best burgers in the world by Bloomberg (Randy Garutti from Shake Shack was among the jury members), and praised by so many others as well, expectations were sky-high, of course. 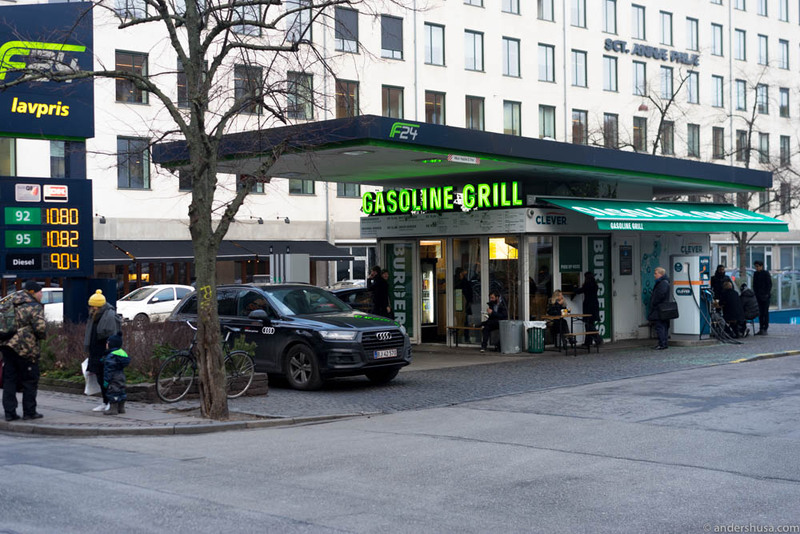 It probably didn’t hurt Gasoline Grill’s reputation that the Noma-crew has promoted it heavily, even ordering it as staff meal, and featuring the place in Rosio Sanchez and Hija-de Sanchez‘ “Chef’s Night Out“-episode on Munchies. Also, the Maaemo-guys, who are busy running a three-Michelin-starred restaurant most of the time, had the pleasure of sharing their details of this delectable burger with me over a drink after the Studio & Friends-event in October. I almost went there that very night, but in the end, I didn’t make it. Let me start by saying that I haven’t tasted all burgers in Copenhagen. Not that I’ve even tried (I might do it as a challenge someday, though). However, I’ve eaten quite a few burgers in my life, and I know fairly well what I’m personally looking for in a good burger. Gasoline Grill has a lot of those qualities. First of all: it’s simple without too much fuss. Just a few select ingredients and vegetables that are thinly sliced to fit neatly under the soft brioche-like bread without making it hard to eat on the go. 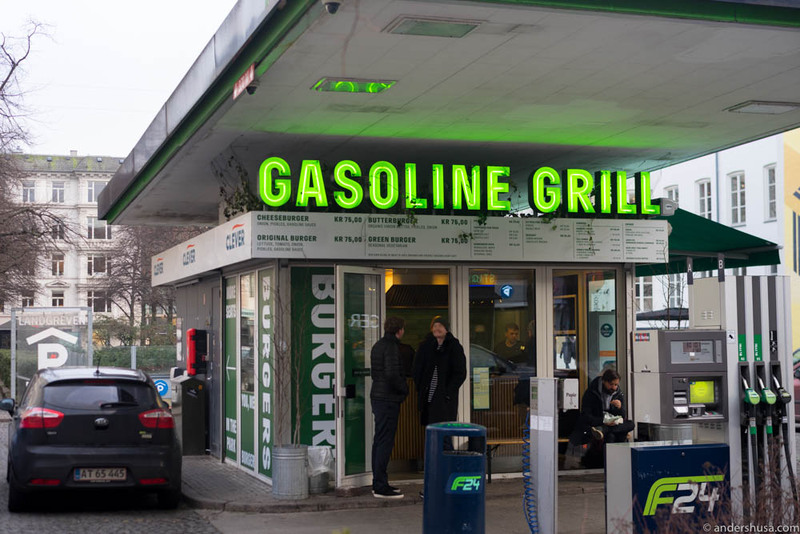 The Gasoline burger is certainly the best burger I’ve had in Copenhagen, and probably in Scandinavia as well. I’m gonna hold back on the world for now. Danish Klaus Wittrup gathered his burger knowledge and passion from living in Chicago and visiting Berlin. Apparently, Burgermeister in Berlin is the top inspiration, which marks a must-visit-spot on my Berlin map for the next visit. At the F24 petrol station, which also has a Clever charger for your electric car, he now sells his own version of the perfect burger. All burgers are DKK 75, and the fries are DKK 20. I didn’t care too much for their 90’s style wavy pommes frites. They were above average, with some of them being crispy on the outside and soft and mushy on the inside – like they should be! Most of them, however, were a bit too soft and actually too salty. That’s coming from someone who loves salt. I asked for truffle salt, but they were out, so I opted for the vinegar salt instead. I wouldn’t recommend that, and sadly the fries ended their lives in the trash (but mostly because I had enough with finishing every bit of my two burgers). The Butterburger is the Best! I ordered the cheeseburger and butterburger. The cheeseburger because I view it as the most basic burger (although the second burger on the menu is called “the original”) and the butterburger simply because it sounded awesome and Bo Bech personally recommended it to me. All burgers are US-style with a buttery and fluffy bun that holds on to the burger and garnish without getting soggy and without being too greasy. The trick is a mix of potato mash in the dough. 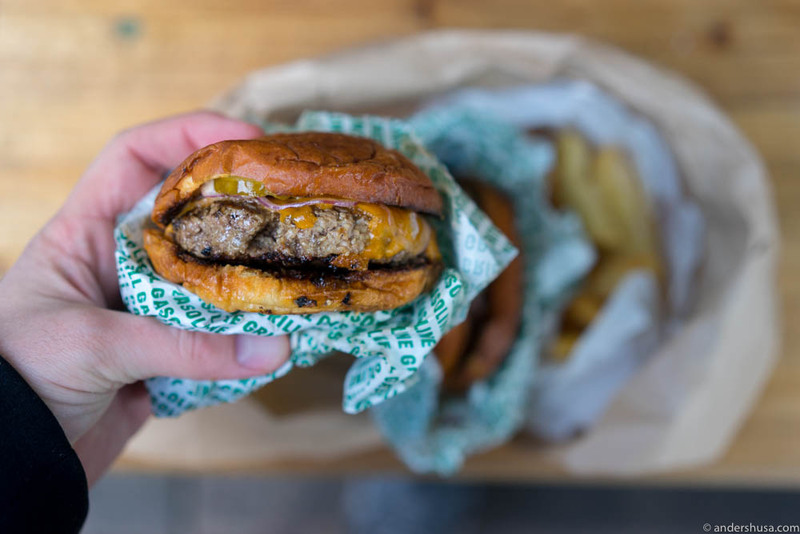 In total, the sweetness from the bun, the salt and umami from the burger, and the acidity of the pickles mix together to an outstanding bite. The organic meat, which is freshly ground every day, tastes really good – a testimony to the producer as much as the chef who has seasoned and cooked it. The butterburger gets, as the name suggests, more butter love by the end, and that really makes a difference. It was a clear winner for me! My friend TK, better known as Bonjour Tristesse or the queen of cheeseburgers, preferred the cheeseburger, though. 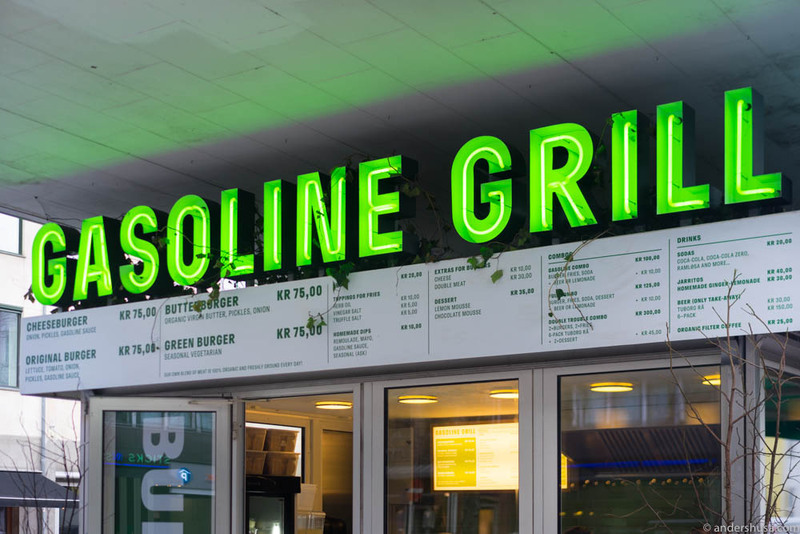 Ever since the hype explosion, Gasoline Grill is experiencing a burger boom and selling out extremely fast – some days as fast as 3-4 hours after opening (they open at 11 AM). After my brunch at Rudo, I headed over here around 3 PM, so I’ll admit I was risking it. I was surprised to see no queue, but about 5 minutes after placing my order the line had grown to about 20 people. There was all kind of people here: hipsters, young kids, and old aunts – I even exchanged some words with a Norwegian chef from Bergen who worked in the city. What’s your favorite burger in Copenhagen, and why? Please share in a comment below. Have you tried Jagger in Istegade? I have not. Noted down! Thanks. To add why you should visit this: It’s founded by former Michelin-star cook, Rasmus Oubæk, which also founded Retour, Pluto and Gorilla, all wonderful restaurants in Copenhagen. It’s a no nonsense burger like Gasoline, and it’s GREAT. They just opened on Amagerbrogade in Copenhagen South as well. I live just next to it and I love it, that’s why I endorse them, haha. I don’t work there or anything.